Curry finished with 23 points (8-16 FG, 4-10 3Pt, 3-3 FT), four assists, three rebounds, and one steal in 31 minutes during Tuesday's 128-95 loss to Boston. 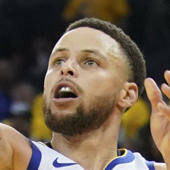 The Warriors suffered their biggest loss of the season Tuesday meaning many of the starters saw reduced playing time. Curry ended with a solid enough line despite playing just 31 minutes, however, the 16 shot attempts were his lowest in almost a month. The Warriors will host the Nuggets on Friday and owners should expect Curry and the team to bounce back for what is a very important matchup.